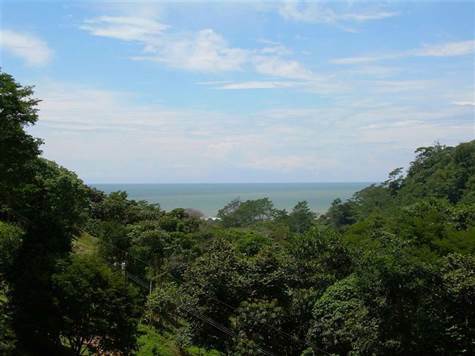 This property is landscaped like Disney Land, and has a mountain jungle view you will never grow tired of. The floor plan is a spacious 3 bedroom, 3 bath, 2-story house that takes full advantage of the ocean view. Conveniently located only two minutes north of the entrance to Ojochal and only 3 minutes off the paved Costanera Pacific Coast Road. The property includes an iron privacy gate and private white gravel driveway. The patio and pool area, as well as the master bedroom's balcony offer beautiful ocean sunset views, while the back side of the house overlooks a majestic mountain panorama. The house has almost 2000 sq.ft. of interior space as well as 700 sq.ft. of covered patio & rancho area to enjoy the cool ocean breezes. This house has also been outfitted with a high-tech motion and infrared security system and locks so you will feel safe leaving your valuables here while away. There is also a bodega for the pool equipment, and a full-time gardener/caretaker has been employed by the owner to keep the 3.38 acre property perfectly maintained. Make this your Costa Rica lifestyle!